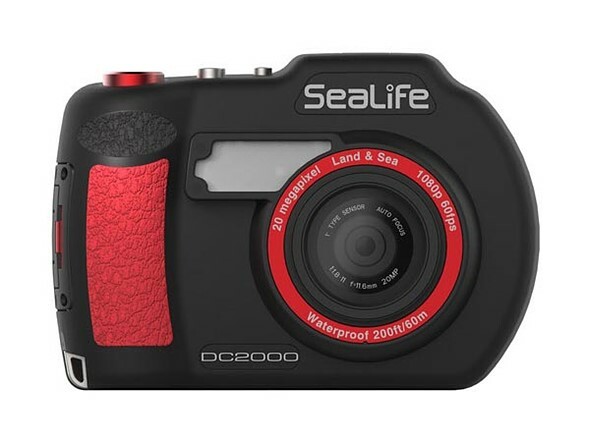 Underwater camera maker SeaLife has launched the DC2000, a 1″ 20MP compact with a waterproof housing rated to 60m / 200ft. The DC2000 is available for pre-order and comes alone or as part of three different sets with lighting equipment bundled. The DC2000 uses a 1″-type backside-illuminated 20MP Sony CMOS sensor and supports video recording at up to 1080/60p. This is joined by a 31mm equiv. F1.8 7-element aspheric lens that can be paired with an optional wide-angle 110-degree fisheye lens or compact wide-angle 90-degree lens. The DC2000 camera is paired with an underwater housing made specifically for the model; it supports water depths as deep as 60m / 200ft. Four underwater camera modes are available with integrated color corrections: external flash, external light, dive, and snorkel. These are joined by 25 ‘Land Scene’ modes for shooting on land. Pre-shooting, time lapse, GIF, and continuous burst mode are also available. According to SeaLife, the DC2000 features sensor-shift image stabilization, support for shooting in both DNG Raw and JPEG, and a dial for manually selecting one of eight shooting modes. Features can also be accessed via the 3″ 920k-dot rear LCD. Finally, content is stored to an SD card. The DC2000 camera without lighting accessories is priced at $700. All four products are available for pre-order now through select retailers including B&H Photo.